Surely, “Don’t Call Me Shurley” is the most exciting Supernatural episode in terms of mythology since we learned angels exist in Season 4. Don’t know about you, but we’re still pretty giddy. “Don’t Call Me Shurley” reminds us why we still love this ever-evolving series after 11 seasons: great stories, engaging dialogue, fantastic music, beautiful exterior shots, amazing sets, cool props, and skilled actors. Do you hear something? That’s the sound of us clapping, and we don’t mean the slow kind. Let’s not bury the lede, because Chuck is back and His Divinity has been confirmed. For the past 5 seasons, fans have debated whether Chuck Shurley was really just a prophet as he was portrayed in Seasons 4 and 5, or if he was actually God. Supernatural not only answered the question, but we learned how God feels about cat pics (they’re super cute), dating (enjoys both women and men), prayer (doesn’t answer ’em), Divine intervention (avoids it), the Winchesters (loves those guys), and Amara (worst sister ever). When Metatron suddenly finds himself in a strange bar, he confirms to his furry friend Toto they’re not on Earth anymore. When he sees that they’re not alone, he walks up to the man alone in a booth with a manuscript before him and asks, “Carver Edlund?” Love that he uses Chuck’s pen name. Chuck’s big reveal came before the title card, giving us most of the episode to watch the fascinating back-and-forth between Metatron and Chuck. It wasn’t just the dialogue that made these scenes so compelling. The outstanding acting of both Curtis Armstrong and Rob Benedict turned things up to eleven. Each added new depth and layers to their existing characters. Rob Benedict went beyond Chuck’s usual “self-doubt and nebbishness,” to play God quite convincingly. When he wanted to make his divinity known, the hard set of his jaw and stern eyes gave him Heavenly cred. At times he actually seemed pretty wrathful. After pressing Chuck to give the Keith Richards version of His memoir, we learn that Chuck had a complex sibling relationship with Amara. After all, He is being and she is nothingness. While Chuck created new worlds, Amara would destroy them. After always getting His toys broken by His sis so many times, Chuck is ready to give up on humanity. Metatron, on the other hand, was genuinely inspired by the presence of the “World’s Greatest Dad.” Metatron became the best version of himself: a scribe who understands the power of storytelling. This former angel will remain mortal, though. When Chuck tells Metatron he’s not getting his wings back, the scribe responds, “Probably a good call.” Despite Chuck’s attempt to belittle Metatron by telling him he was chosen as scribe because he was the angel closest to the door, Chuck is still inspired by God. When he accuses Chuck of giving up, it has an impact on the Big Guy. If you’d asked us who’d be the one to get God back in the game, we’d never have guessed it’d be Metatron, but it works. Curtis Armstrong had us in tears with his moving performance. We would’ve been happy to spend the entire ep watching these two, but the narrative of Sam and Dean Winchester following signs of Amara was well integrated into the episode. 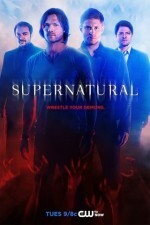 Dean learns that even though Amara wants to destroy the world, she plans on keeping Dean safe. She’s taken quite a shine to the elder Winchester brother. It’s a mixed blessing to have an irresistible connection to a powerful entity like Amara. The Winchesters’ narrative had some great moments as well, and not just Dean using beer to iron Sam’s shirt. After Sam is infected, Dean refuses to leave his brother. As Sam lies dying, Dean takes a deep breath of the poisoned fog so they can go out together, but Amara isn’t going to let Dean go that easily. The two threads came together after Chuck finally changed his position on Divine intervention. With God’s help, Sam is fine, as are all the others in Hope Springs. The moment when Sam and Dean followed the glowing amulet to Chuck was pretty exciting. Supernatural knows how to tell a story. “Don’t Call Me Shurley” was overseen by two Supernatural giants—not literally, of course. Robert Singer directed and Robbie Thompson wrote the story. Thompson managed to slip in a fun reference to series creator Erik Kripke when we learned that Chuck was working on a new series call Revolution. The dialogue between Metatron and Chuck was captivating and revealing. The story was enhanced by the music of the Rolling Stones, BB King, the Beach Boys, and Rob Benedict doing a version of a song previously covered by Bob Dylan. Both the indoor and outdoor venues for the conversation between Metatron and Chuck were set perfectly. The musical references in the dialogue and the set were fitting for Louden Swain singer Rob Benedict, as well as having Chuck sing at the end of the episode once he decides to join the fight. The details really do make a great story. You always knew the Samulet would be important again, didn’t you? Dean may have believed that the Winchesters can only rely on each other, but it looks as though they can count on God sometimes. Can Supernatural top “Don’t Call Me Shurley”? We’ve got three more episodes to find out. See our full recap of “Don’t Call Me Shuley” here.